Thank Klaatu I'm on tank water so my thinking is right!!! ...that's gotta be the quote of the day for me!!!!! ... cheers... Stickyfingers. D'oh! Double post. Please delete this one admin. Last edited by Marius on Wed Jan 07, 2009 10:55 pm, edited 1 time in total. TWMcCallum wrote: The term 'No Evalutionary Predecessor' means that the paticular gene did not evolve on this planet, it had to evolve elsewhere. Where? Another Planet with conditions identical to here? How far away is this planet, and by what means did they get here? Again, should this scenario be actuality, how did these incredibly similar to us creatures get to where they are. Is it a case of parallel evolution? ie the shark and the dolphin. Did they have a supernatural origin instead? How would you go about finding evidence of all this? Why should one need to know which planet, how far away , who exactly were these entities etc? The point is that you are using this unlikely and very unproven scenario to add weight to an already unusual and unlikely hypothesis. It has doubled the problems with the "anomalous" genes hypothesis. 'It is not that easy. You cant just say "oh well, it as aliens that did it". Now you have to establish yet another difficult proposition. The fact is that we have these anomalous genes (well that remains to be established), and the people who profess to be experts say they have no evolutionary predecessors ( please, who?) and that means that they never evolved on this planet. I am not a geneticist nor do I have the sophisticated equipment to do genetic research, no I just surf the internet picking up theses little gems of information, the people that post them out there seem to be what they say they are so I find it quite easy to accept their finding. I'm not going to compile a list of sites to back up this claim, if you can't accept the things I say then go and Google the subject up yourself and draw your own conclusions.Well lets give it a google and see what eventuates. Tw, I'm not the one who is making these Alien DNA claims. The burden of proof is very much yours. If you have no faith in your sources, then you should reconsider your position. If it is just your opinion, then state that. If you don't name your sources, your position is compromised by being unverifiable. The discovery that our genome has these 223 anomalous genes nails the coffin lid closed on Darwin's theory of evolution. Unless you can provide sources, no it doesn't. Plus, what kind of anomalies exactly. That isnt an answer. Thats just restating your initial premise. HOW does it affect the theory of evolution? Do you understand how evolution by natural selection works? How species are selected by their environments? Do you understand the implications of a mutation free genome? Every body has heard Darwin's theory of evolution, it was taught in school when I was there, if he was right then our genome would only contain genes that were common to other creatures in this world, in other words we would not have the 223 anomalous genes. "then our genome would only contain genes that were common to other creatures in this world." I don't quite understand what you are saying here. We have Aprox 30-35 000 in the HUMAN genome. We share many common characteristics with many other creatures (warm blood, mammal etc). There may well be pieces of viral DNA and plenty of junk DNA, but it is all ours. Do you suggest that evolution makes us chimeras, beasts made out of others and not a stand alone species? Again, I must ask, how are these genes anomalous? Could you link to a site that describes this? I am having some amount of trouble finding anything remotely coherent. As you would agree, there are sites that earnestly and honestly state the earth is flat, despite the evidence. The consensus midst the scientific community is that evolution by natural selection ( Not Darwinism) is the best explanation for how life, well evolves.. Darwin was just the bloke who published the theory initially. Do you use electricity? Then you must be a Voltist, or are a Gatesist who uses a p.c. Sorry for the tangent, but the whole "Darwinist" epithet is a personal bugbear of mine. So often it is used as a derogatory statement by the followers of Jesusism. David Pratt covers off on most of the common pros and cons about Darwin's theory. I am not into Theosophy nor do I like his reference to Rex Gilroy's findings, but he does cover the subject well. Perhaps you might like to re visit some of the other questions I previously posed to you. What then, is your opinion of the extinction of the Neanderthals, or what percentage of chimp DNA is alien? My opinion of the extinction of Neanderthals is this; It is a great pity they didn't make it to modern times. As far as chimp DNA is concerned, my understanding is that the genome of the chimp has not been extensively mapped as it has been in humans. There are claims that chimps and humans have 98% similar genes however a mouse has about 75% and a dog has about 85% of the same genes so this comparison would seem to be of little real value. So no alien interference? Why not? It is my understanding that humans are unique in having 223 genes not shared by any other organism on this planet. I would really like to see the source of this understanding. Here is another unique organism. "The scientists identified 349 genes that are present in algae and plants but not in humans and other animals. More than 200 of these genes have unknown functions, a fact that surprises the researchers." Are we to assume then, that algae has been altered by alien DNA also? Here we share some common ground. I have no inclination to accept that the Yowie, or any other beast real or imagined, has any paranormal atributes, and like yourself, would appreciate some really nice evidence. I am coming from a null hypothesis. I will reach a conclusion based on the evidence. Many of the posters I read here are approaching from a different angle. 1) Hypothesis = yowies exist. 2) Find evidence that backs hypothisis. I admit, my standards of evidence are high, but they must be. The scientific method demands it. They're flesh and blood as far as I'm concerned. I'm not a believer in the paranormal. Simon M wrote: They're flesh and blood as far as I'm concerned. I'm not a believer in the paranormal. Why not flesh and blood with paranormal abilities that exceed the current knowledge and limits of modern human science? Try not to be concerned at all, there is no point in trying to figure out how ,why or what these incredable entities are. They are what they are and will remain in that state for thousands of years after, we go. I think once you observe some for awhile, you will be amazed at what you discover. It could open your mind in regards to this 3 dimensional world we live in, which some can only observe. This is only the milli mute part of the picture. I think the "HairyOnes" have an unjustifiable gift, to transcend from the 3rd and 4th dimensions, at will. No one will make them change, they are already at a level beyond our comprehension. Nothing can be discounted, of course, in the absence of any evidence to the contrary.....but I still think the Occam's Razor principle applies. I shoud have wrote: flesh and blood with abilities that exceed the current knowledge and limits of modern human science. Hey Welly. You should sneak into their dimension and set up a couple of trail cams mate! In my opinion, they are flesh and bone, not flesh and blood. Bigfoot and Dogman have both been shot from point blank range with high calibre rifles but no blood trail was left whatsoever. They must be tough little bleeders then. There are numerous reports of them being shot and buckets of blood left behind. Not in the reports I have read so if you could direct me to these reports I would have to concede they are flesh and blood. When i first read some reports that they were paranormal i thought "wow people have gone to far now", i thought it was a crazy idea.But I can only go on what i have felt out there. They must be flesh and blood but very much are paranormal in some way. I sense when they are out there, times i have known where they are standing ( and a rock drops right at that exact point while i walk past it), i have been touched (on 2 occasions) and been followed all the way to the car with one walking right next to me, I heard its footsteps for ages. I hear it and dont see it, which i believe they can disappear. I am not hallucinating ( I know that because theres been times i have gone out and feel nothing. I dont put these things in my reports because of the negative feedback, but they run past us, we dont hear there footsteps running--they glide, with the trees being bashed. We have videod a tree coming down next to us and ron viewed something hairy up on the tree next to it---but NOTHING showed up in the video? adventurer wrote: When i first read some reports that they were paranormal i thought "wow people have gone to far now", i thought it was a crazy idea.But I can only go on what i have felt out there. They must be flesh and blood but very much are paranormal in some way. 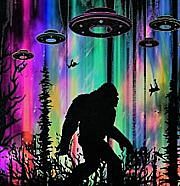 May sound insane to some but not to the majority on this website if they are being honest, I find it absolutely compelling reading about people's experiences with the Yowie and Bigfoot and there are very few I would actually refute although there are a few shyster stories from time to time but they are not too hard to differentiate. I've never had an experience as yourself and I am not too sure I would want to. I did have an exposure of sorts when I was a kid while camping in the bush with mates, I could hear footsteps around me while in my sleeping bag but no visual sign of anybody around. I had no idea of Yowies back then so whether they were or weren't I'll never know. There are plenty out there. Sasquatch Chronicles has several reports documented of them being shot, people following the blood trails, etc but never catching up with the bodies. A good one is Siege of Honobia. Mike Humphries and his brother killed one. It flopped around a bit and died. They rushed out to get the body but were bull rushed by the other troop members who dragged it away. Also Vic Cundiff's Dogman Encounters has several reports of animals being shot. One memorable early one is a report from a fellow whose Uncles take him out to clear a property of troublesome dogmen. They till all around the house and set bear traps driven well into the ground near the windows. That night they get one caught and go out to blast it with shotguns until dead. The witness goes into great detail about what the dead body looked like. Another is an encounter from military guys who go out with very powerful weaponry. A dogman had been standing up to regular hunting rifles but takes off running when it takes a hit from a 50 cal which blows a hole in one shoulder. They followed the blood too I think, but it eventually dried up (could be mixing this up with another encounter). I will add there are also many reports of finding very human like, but giant s too, and multiple witnesses describing their hairy s with bits of poo caught int he hair... adding to the 'animal' argument considerably. Report what you want Dee. If thats what you see (or dont see!). It seems your not alone from what some forum members are saying. I have zero personal experience with anything remotely paranormal, spiritual or otherwise out of the ordinary. I've never seen a Yowie, or felt a weird presence when I've been out in the bush fishing or camping. I find it difficult to accept that these creatures are anything other than flesh and blood, and feel that the more bizarre aspects people speak about have some other explanation apart from a paranormal or 'interdimensional travel' type of explanation. Just my opinion, and I could be dead wrong. The weight of evidence - despite the absence of definitive proof - has convinced me that there's an unknown creature out there in the wilderness, and that's as much as I'm willing to accept given my current level of understanding. I do think it's possible they may use infrasound to confuse and disorient their prey (or anything they perceive as a threat). I also think they have a detailed and intimate knowledge of features of the landscape which we generally do not - such as underground cave systems, for example, or various places where they can hide so as to seem to have vanished - and that they're able to use this knowledge to camouflage and conceal themselves in subtle and ingenious ways. They have great strength, endurance and agility and are observant and intelligent in a manner which is akin to our own intellegence, albeit different in many ways. Nothing wrong with your opinion. Maybe one day you will see what the rest of us mean though.